By Katrina Guevara 17 Comments · This content may contain affiliate links. What study strategies can you use to help kids? It’s not just buying flashcards anymore! There are so many ways to help your children learn their letters, sight words, and new vocabulary terms. I love when I can combine learning with books, crafts, and experiments. It makes it more fun for us all. However, there are times when learning may need to be structured or a goal needs to be met. When my Ariel & Belle get home from school, we can’t always turn every activity into a fun new project. In fact, most of the skills they bring home are concepts that need to be memorized by the end of the week. They have spelling lists, frequency words, and vocabulary terms that change weekly. We need engaging strategies that also allow us to meet these goals quickly. What a child has listed as homework can be made more interesting to increase retention. I have been noticing a pattern in the homework packets that come home for my children and other students I work with. I find that there are a lot of different ways to teach these skills. Last week I was helping a friend develop a new study method to help increase her child’s sight word recall by using the strategies I will list below. The mother was pleased with how quickly his results were improving. She was wishing she had learned how to use these simple strategies at the beginning of the year. These aren’t new or magical ideas! I think as parents we just need to share strategies with one another. Here are two Study Strategies that are my “go-to” methods to help get the most out of homework time. Homework Given: Write each spelling word 5 times. Goal: To learn how to spell the words for test on Friday (short-term) and continue to spell word correctly in daily writings (long-term). Pit-Fall: Student rushes through writing words silently by copying off a list. Added bonus: Child uses word in a spoken sentence. Goal: To know a word from memory without having to sound it out or think about it. Pit-Fall: Student attempts to read down type written list given by teacher multiple times, remembering them in order and not necessarily mastering them without that cue. Study Strategy: Engage different learning styles by creating your own flashcards. One way I like to do this is by helping the student make the cards a little special. On one side I write the word clearly in black print. On the back I have the student write the word in pencil. Then we talk about the word and what it makes them think of. We add pictures, signs, and symbols around the word to give us clues. By now the student has seen the word, spoken the word, used it in context, and found connections for the word. When we practice with our cards, I only show the side with the word in black print. The pencil on the back should not be seen. If the child can not read the word in less than 2 seconds without having to sound it out, then I let them see the back to help remember. Added Bonus: Make it a game to see how many cards the student can get correct without any help. 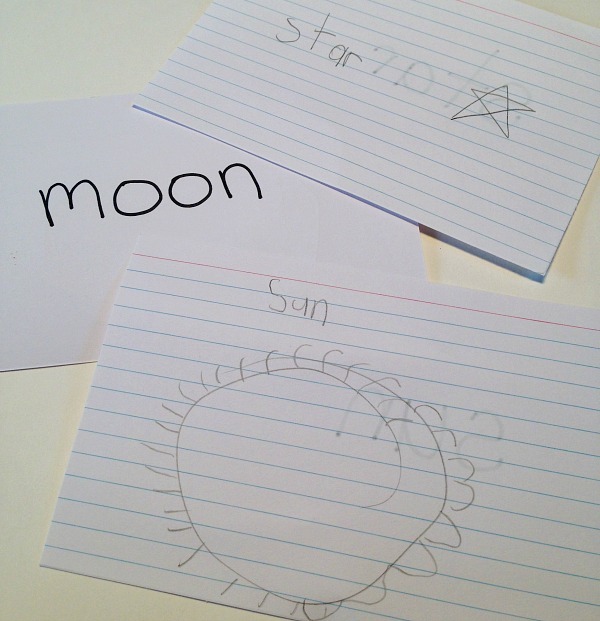 Make a small mark on the back of the cards that are easy for the child to recognize. Keep track of progress by counting marks each time. I’ve listed two of my favorite “go-to” Study Strategies, but the list could go on for days. Do you see any homework pit-falls in your home or are there any areas you would like some new strategies to help? Let us know! I’ll gladly try to pass along any strategies that I frequently use to help out another parent! At our house we like to use scrabble tiles to practice spelling words. This is both a visual and tactile way to learn them. Thanks for the other ideas. I can’t wait to try them out this wee. Excellent suggestion! Thanks for sharing. Any strategies for sight words that can’t be made into pictures? My daughter still struggles with words like said, there, was, when, etc. so any help would be appreciated! I find those sight words just need to be practiced with a lot of repetition. You can make it a little more fun by using simple games like (1) writing the words on post-its placing them all over the house then doing a scavenger hunt, (2) use various tools to practice writing–and then reading–the words like magnetic letters, wikki stix, chalk, play dough, stamps, etc and (3) reading often–we like the simple sight word books and it is often possible to find ones that focus on the words you are targeting. I hope that helps! I make small word search puzzles–just 5 or so words at a time. I use one of the free online sites that makes them and print it out. The kids love word searches and by only focusing on a few words at a time, it makes it easier and less daunting for them. It’s fun and not work! Thanks for the concise tips! Good ideas. Another thing that works is making each word into a puzzle. I print the words in large font. Then cut the words (separating the letters) and glue them on construction paper for durability and cut them out again. One word at a time, I spread the letters out and let my son put the word together. After a while, he could guess which word it will be. Then he writes it down for practice. Kids love puzzles. Great idea, Yadira! This is a fantastic idea. Love the writing it down part at the end to reinforce the “hands-on” work that they just did. Thank you! I love that step too…as an adult who still has to write things down to remember them it is a great reminder that we’re addressing different learning styles by including various strategies. Great tips. My kindergarteners have to learn to read, spell, write almost 100 words by the end of the year! Thanks for sharing at the after school link up. Very interesting! I am making an unusual round up for this Monday of posts that “made me look”, and yours is one of them. thanks for sharing these great ideas! I Can’t wait to try these out this week. It’s always such a struggle to get my 7 year old son to work on practicing his spelling words. I think this will help. I’m so glad you found these ideas helpful, Christy! Please stop back by and let us know which strategies worked best for your son.